ECARS Swap and Shop. Items for Sale, Trade or Wanted. NOTE: ECARS is not responsible for content of any ads. ALL Swap & Shop items listed are for BOTH On Air AND On Line. In order for your items to be listed in EITHER of these Swap & Shop listings, you MUST FILL OUT THE LISTING FORM found HERE. If you list an ON AIR item, it is NOT automatically included in this listing. 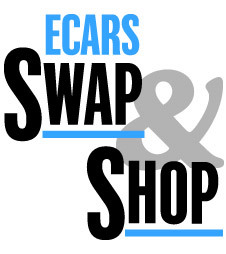 ECARS On Air Swap & Shop is on 40 Meters 7.255 from 11:00 AM to Noon on Saturday.